In an era of increasingly thin and light laptops, someone at Acer must have said, "Screw that!" and convinced the top brass that what the market really needs is a monster sized notebook built around a 21-inch curved display. Hence, the Predator 21 X was born. It's the polar opposite of an Ultrabook, which we hear makes a great snack for the Predator 21 X.
Acer's big to-do here is that no other laptop in the world has a curved display. Curved panels are supposed be more immersive than flat screens, though the effect probably wouldn't work very well on a 13-inch or 15-inch laptop. As such, Acer jumped straight to 21 inches. The display in question is an IPS panel with a 2,200R curvature and a rather tame 2560x1080 resolution (compared to the rest of the hardware). It also has G-Sync support and integrated Tobii eye-tracking technology. A 7th generation (Kaby Lake) Intel Core i7 processor mingles with up to 64GB of DDR4-2400 RAM (there are four DIMM slots), two GeForce GTX 1080 GPUs in SLI, and up to 4TB of SSD storage with RAID-0 support. It also has an HD webcam, full-size mechanical keyboard with Cherry MX key switches and RGB backlighting, a number pad that flips over into a touchpad, and a 4.2 audio system. That's a lot of high-end, heat producing hardware for a laptop, though this isn't a skinny system. It measures 568 x 314.5 x 83.25mm (WxDxH), room enough to accommodate all those components plus a five-fan cooling system with three AeroBlade metal fans. There's no mention of battery life, but let's not kid ourselves, you need to park this thing next to a power outlet for any kind of extended use. You wouldn't want to tote it around more than absolutely necessary anyway—it weighs 8 kg (~17.6 pounds) and requires two power supplies. 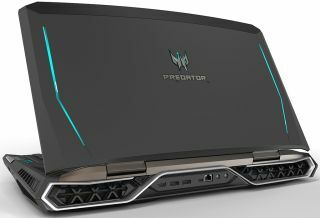 There's no mention of cost, though Acer says you'll be able to configure a Predator 21 X starting in January. The long lead time is probably there to help Acer gauge interest. Not that anyone else is likely to try competing in the 21-inch notebook category.